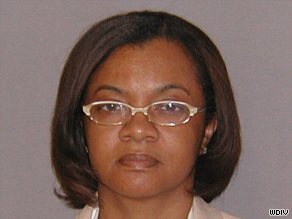 (CNN) -- Monica Conyers, Detroit's embattled City Council president pro tempore, pleaded guilty Friday to conspiring to commit bribery, a federal court representative in Michigan told CNN. Detroit City Council member, Monica Conyers, admits accepting bribes to sway a $1.2 billion contract vote. Conyers, 44, admitted accepting bribes in exchange for her vote to sway the City Council to approve Synagro Technologies Inc.'s $1.2 billion contract in 2007. It's unclear when Conyers, the wife of U.S. Rep. John Conyers, began her relationship with Synagro, but court papers say she received money from Synagro until December 2007. Conyers voted in favor of the wastewater treatment contract on November 20, 2007, the same day she received an envelope filled with cash from Detroit businessman Rayford Jackson, court papers say. Jackson pleaded guilty to providing Conyers with the money. He had been a paid consultant of Synagro. On December 4, 2007, Conyers received another envelope of cash from Jackson in a McDonald's parking lot, said Terrence Berg, the U.S. attorney from the eastern district of Michigan. "She was the swing vote in this deal," Berg said. "She used her power to get the deal done, and she acknowledged that." The mood was somber at Conyers' office on Friday, an official there told CNN. A few office workers cried. They found out about the developments through news reports, said Denise Tolliver, Conyers' deputy chief of staff. "We've been going through this for a while," Tolliver said. "Reporters would ask us questions about anonymous sources, and we just didn't believe them." Office workers were preparing for an afternoon meeting with City Council President Kenneth V. Cockrel Jr. later Friday. According to state law, Conyers will have to forfeit her seat, Tolliver said. "It hurts the City Council's image, for sure," Cockrel said. "But we need to remember, this is only one member of the council. You can't paint the entire council with the same brush." For a seven-month period in 2008, Cockrel replaced former Mayor Kwame Kilpatrick after Kilpatrick pleaded guilty to two counts of obstructing justice. During that time Cockrel terminated the city's contract with Synagro because of rumors circulating about bribes, he said. Conyers faces a maximum penalty of five years in prison, according to prosecutors. Synagro would not comment on Conyers' plea, but a spokeswoman said, "We have cooperated fully with the federal investigation and will continue to do so."